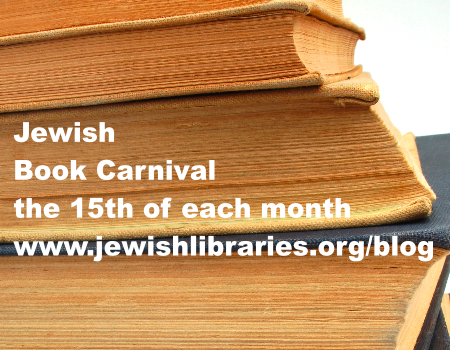 The Whole Megillah is pleased to once again host the monthly Jewish Book Carnival! Deborah Kalb interviews a variety of authors on her website, Book Q&As with Deborah Kalb. She recently interviewed Sarah Kaminsky about her book Adolfo Kaminsky: A Forger’s Life, which recounts the life of her father. In Fresh Ideas from HBI, Jessica Fishman, author of Chutzpah and High Heels: The Search for Love and Identity in the Holy Land,tells the story of the journey that led her to rethink matrilineal lineage in Judaism and write a memoir. Over at Hebrew Union College’s blog, Needle in the Bookstack, we are highlighting one of our recent and unusual cook-book acquisitions. Rather than spotlight a post from their own blog this month, the folks at Fig Tree Books encourage everyone to tune in to this year’s Henry N. and Selma S. Rapaport Memorial Lecture at the Jewish Theological Seminary. Titled “Wondering Jews,” the event will feature Rabbi Joseph Telushkin in conversation with FTB author Abigail Pogrebin. It will be streamed live, at no charge, from the Jewish Theological Seminary on March 27. And rather than feature a post from her own “My Machberet” blog this month, Erika Dreifus points those interested to an event recorded last month at the U.S. Holocaust Memorial Museum in Washington: “Memory Transferred: Voices from the Descendants of Destruction and Displacement.” The event included several authors whose writings are connected with their European-Jewish families’ experiences in the 1930s and 1940s (Rachel Hall, Suzanne Reisman, and Sarah Wildman in addition to Dreifus), as well as writers from other backgrounds. From Heidi Rabinowitz and The Book of Life, an interview with Meira Drazin about winning the Sydney Taylor Manuscript Award for her unpublished middle grade novel about the friendship between two contemporary Orthodox girls, called Honey and Me. From People of the Books, the AJL blog, there’s an opening on the Sydney Taylor Book Award committee, a great volunteer opportunity for Judaic kidlit fans! At Jewish Books for Kids, Barbara Bietz interviews the author and illustrator of A Hat for Mrs. Goldman, this year’s Sydney Taylor Honor Award Winner. From Shiloh Musings comes a review of The Conversations We Never Had by Jeffrey Konis, an imaginary series of interviews with his Grandmother Olga who was really his great-aunt. Many Jewish families can relate. Wonderful book. Finally, at The Whole Megillah | The Writer’s Resource for Jewish Story, Barbara Krasner interviews picture book author Linda Leopold Strauss about her newest publication, A Different Kind of Passover. This entry was posted in Book Reviews, Uncategorized and tagged a different kind of passover, a hat for mrs. goldman, Adolfo Kaminsky, Association of Jewish Libraries, Barbara Bietz, Book of Life, Chutzpah and High Heels, deborah kalb, Erika Dreifus, fig tree books, Hebrew Union, Heidi Rabinowitz, Honey and Me, Jeffrey Konis, Jessica Fishman, Linda Leopold Strauss, Meira Drazin, My Machberet, Needle in the Haystack, Rachel Hall, Sarah Kaminsky, Sarah Wildman, Suzanne Reisman, Sydney Taylor Book Award Committee, Sydney Taylor Manuscript Award, The Conversations We Never Had. Bookmark the permalink. Nice collection here! Thanks for hosting. Thank you very much for including my book, Chutzpah & High Heels, and article on matrilineal lineage in this list! Thank you for writing the book! Thanks so much for including my review. Lovely roundup.